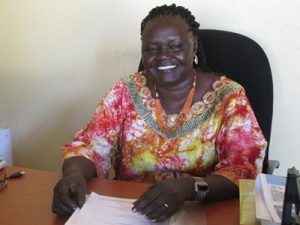 Before joining the SSCC, Agnes worked in accounting with the Regional Government of South Sudan in Juba prior to independence, as well as for the German Leprocy Relief Associaltion in Khartoum, and as a coordinator for the social ministry and education with the Catholic Achdiocese of Khartoum. She returned to Juba in South Sudan in 2010 and voted for South Sudanese independence in the referendum. After the independence in 2011, Agnes joined the of Catholic Archdiocese of Juba as Coordinator for Emergency Preparedness until 2013 when she joined the SSCC as the NWP Coordinator. 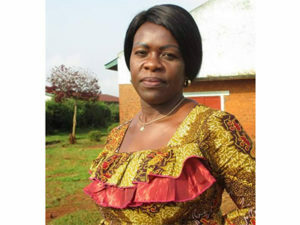 Chantal Bilulu is a women’s rights advocate from the Congolese human rights organization Héritiers de la Justice. 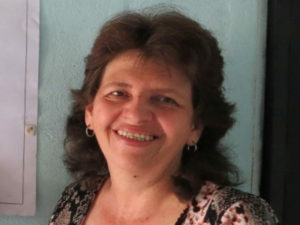 Gloria Amparo Suarez is an executive member of Organización Femenina Popular (OFP) in Colombia. For more than four years, she has been legally representing the OFP while also supporting women’s social movements. 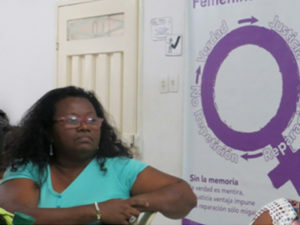 In addition to her position with OFP, Gloria is a part of the Municipal Board of Victims in Barrancabermeja where she is a representative on gender issues. Gloria has extensive experience in providing psychosocial accompaniment to women victims of armed conflict and as an advocate for human rights, peace and gender justice. This has allowed her to participate in international meetings on human rights, such as conferences, gatherings, and workshops in Austria, Sweden, Spain, Norway, Denmark, the United States, Canada, Ecuador, and Switzerland, and Venezuela. Alexandra Alhucema Lizarazo is a professional public accountant with more than ten years of experience working with the Organización Femenina Popular (OFP). Alexandra has participated in diverse actions that promote the defence of human rights for women in places across Colombia. She is a member of the OFP’s administrative team and financially manages the organization’s international cooperation projects along with projects with national government entities, such as the National Unit for Victims. Additionally, she works on social projects with municipal governments in order to benefit the women who are part of the OFP’s organizational social process as well as the overall community. 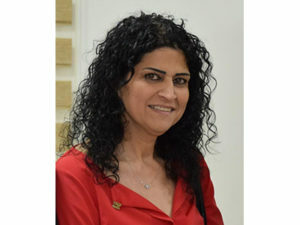 Lucy G Talgeih is the Women’s Coordinator at the Wi’am Palestinian Conflict Transformation Centre. Lucy holds a MA in Democracy and Human Rights from Birzeit University and strives to work for women’s rights, eradicate extremism, and promote a more peaceful homeland. Reflecting her passion for human rights, Lucy is a member of the United Nations Security Council Resolution1325 national coalition in Palestine and has participated in developing the national action plan and in the development of the national strategy. She is also a member of the national committee working on the Convention on the Elimination of all Forms of Discrimination Against Women (CEDAW) shadow report on Palestine. In addition, Lucy was recently elected as a municipality council member of Bethlehem. 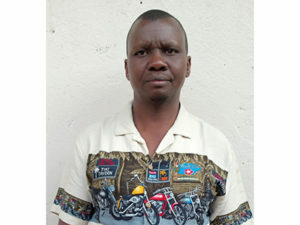 Gérard Kwigwasa Nakahuga is the Executive Secretary of Héritiers de la Justice (Heirs of Justice). 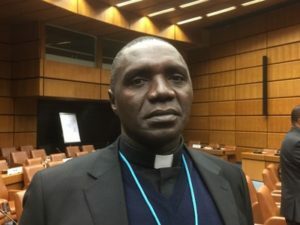 He has been very engaged in conflict transformation, peace building and advocacy with Héritiers de la Justice, and has been part of its network for nearly 25 years. Among other things, Gérard has been an MP (Député or national minister of parliament), is on the supervisorial board of La ligue des droits de la personne dans la regions des Grands Lacs – LDGL (League for the defense of human rights in the Great Lakes region), and has been the headmaster of a secondary school. 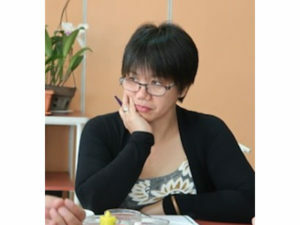 Vernie Yocogan-Diano is currently the manager of the KAIROS Women, Peace and Security project in the Philippines. 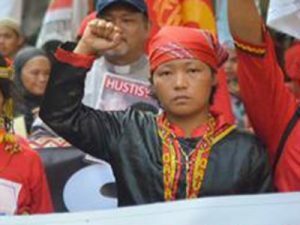 She is an Indigenous (Kankanaey-Bontoc) woman, a mother and a human rights and community activist from the Cordillera, Philippines. She has extensive experience working with Indigenous women in the Cordillera region as chairperson of Innabuyog, member of the Regional Council of the Cordillera Peoples Alliance (CPA) and most recently Executive Director of the Cordillera Women’s Education Action Research Center (CWEARC). Vernie has been to Canada on a number of occasions on the invitation of KAIROS and the United Church of Canada. Vernie participated as an international witness at Truth and Reconciliation Commission (TRC) National Event in Quebec (2013) and was in Ottawa for the TRC National Closing Event in 2015. Tarek Al-Zoughbi is a Christian Palestinian American, who was raised in the little town of Bethlehem. He received a B.A. 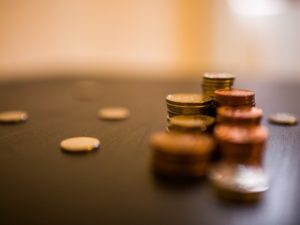 in Economics and Peace Studies from Manchester University, Indiana and returned to Bethlehem, where he currently works as the project and youth Coordinator at Wi’am: The Palestinian Conflict Transformation Center. Aside from working on an M.A. 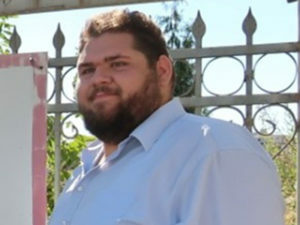 in International Cooperation and Development at Bethlehem University, Tarek also serves on the Executive Board of the National Coalition of Christian Organizations in Palestine and is currently the coalition’s treasurer. He is active in civil society, part of 3 choirs, and had the privilege of being part of the World Council of Churches “12 Face of Hope Campaign”. Dr. Anie Bautista is the National Coordinator of the Ecumenical Voice for Peace and Human Rights in the Philippines (EcuVoice). A medical doctor by training, she is a committed and passionate human rights defender who serves the poor and marginalized members of Philippine society. EcuVoice is a national ecumenical network of church leaders, human rights defenders, civil libertarians, survivors, and victims of human rights violations who are committed to collaboratively defending and promoting human rights and advocating for a just and lasting peace. 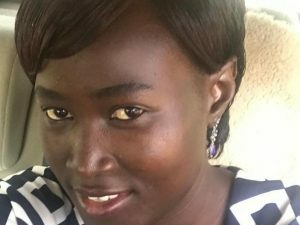 Awak Deng is the Youth Coordinator of the National Women’s Programme of the South Sudan Council of Churches. She was born in Khartoum, Sudan, and is from the Dinka ethnic group. She has been an active member of the Sudan Evangelical Presbyterian Church in Juba. Awak organizes seminars for youth, including those focused on women and girls, inside and outside the churches. 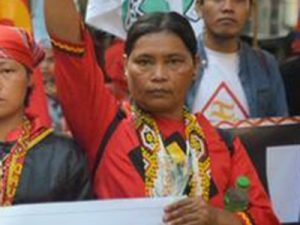 Eufemenia Campos Cullamat is a Lumad woman leader from Tandag, Surigao del Sur, Mindanao. She is a council member and one of the founders of Malahutayong Pakigbisog Alang sa Sumusunod (MAPASU), and a community development worker with the Tribal Filipino Program of Surigao del Sur (TRIFPSS). She comes from a family of leaders. Her father was the ‘datu’ (Tribal Chief), her brother the founding chair of MAPASU, and her other siblings are also community leaders and organizers. On September 1, 2015 a paramilitary group rounded up all the people in her village and killed MAPASU Chair Dionel Campos, Tribal Chief Datu Juvello, and Emerito Sarca, Executive Director of the Alternative Learning Center for Agricultural and Livelihood Development (ALCADEV). Femia and her siblings were among the first Lumad leaders to travel to Manila to give evidence about the massacre. Femia continues to work on the frontlines, organizing women and ensuring that women have a place in the struggle for Indigenous people’s rights and justice. 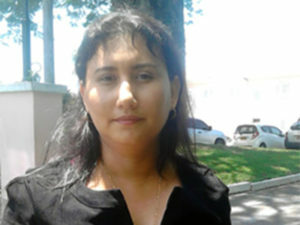 Isabel Caicedo Polanco was born in the city of Barrancabermeja, Magdalena Medio. She has been a member of the Organización Femenina Popular (OFP) since March 7, 2011. She is a community development and human rights promoter with more than 20 years experience in social work with women, girls, boys and youth at the grassroots level. She is trained in human rights, has skills in group management and has experience high school teacher. Nenita Condez is from Zamboanga del Norte. She is the Deputy Secretary General of the Salabukan nok G’taw Subanen (SGS), a federation of Subanen groups. Nenita is a passionate spokesperson who values the importance of collective work. Since 1996 the Subanen have been dealing with the giant Canadian resource extraction firm, TVI Pacific, Inc., which began mining on Mt. Canatuan in Siocon, Zamboanga del Norte, a sacred place for the Subanen. 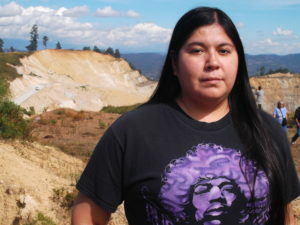 Nenita helped organize community resistance against plans to extract copper from ancestral land that was forcibly taken from the Subanens. At one point Mt. Canatuan was barricaded to keep Indigenous peoples out while the copper was being mined . Nenita advocates for women’s rights and against the idea that a woman’s place is in the home. She encourages women to bring their energy, hearts and minds to the struggle to protect Subanen ancestral lands. Nenita’s life is under constant threat from soldiers in her village. She finds safety in the support of Indigenous communities. Her initiative and passion for collective action and the involvement of women is effective and inspiring. 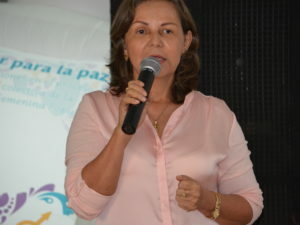 Yolanda Becerra Vega is a Colombian human rights defender and peace activist. She has been a member of the Organización Femenina Popular (OFP) since 1980, and is currently its National Director. Yolanda has dedicated her life to struggles for the defense of territory, human dignity, and peace. 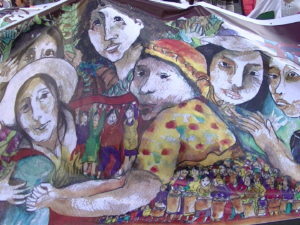 As a leader in the women’s movement, she inspired the “Social Movement of Women against the War and for Peace”, an expression of the grassroots social and rural movements in the region of Magdalena Medio, which along with other women’s movements in Colombia advocated for the participation of women in the recent peace process and accords. 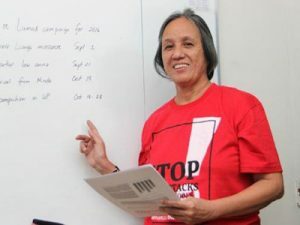 Yolanda has worked for more than 30 years shoulder-to-shoulder with grassroots women and men in the midst of war and in the presence of armed actors – state, paramililtary and guerrilla – in a region where the disparity between rich and poor is extreme, and serious human rights violations are common. For this work she has been recognized nationally and internationally. Yolanda also suffered political persecution, gender based discrimination, and sexual violence, during the war. Yet, despite these threats, she was able to lead the OFP in a process of collective reparations as a means to reconstruct the organization’s identity, and the social network and peace in territories and communities. Currently, she is leading initiatives including the construction of a Museum of Memory and Human Rights for Women and the development of a Women’s Agenda for Territory and Peace. KAIROS has worked in partnership with Yolanda Becerra and with the OFP, which has spent 46 years resisting violence and defending life, for more than 15 years. Together we have built the KAIROS Women of Courage Program which seeks to increase the participation of women in peace and deve­lopment processes and in defense of human rights. The work the OFP is emblematic of this program. Yolanda and OFP Youth Delegate, Kelly Johana Campo, will participate in two events in Montreal at the end of April: the International Colloquium of the Responsibility of Memory: Social and theoretical perspectives on Truth, Justice and Reconciliation in the Americas, April 25-26, 2018; and the International Gathering ¨Women’s Struggles for Defense of the Land: Feminist Resistance and Solidarity Against Extractivism¨ April 27-30, 2018. Stay tuned for further information on the OFP visit and these upcoming International events!